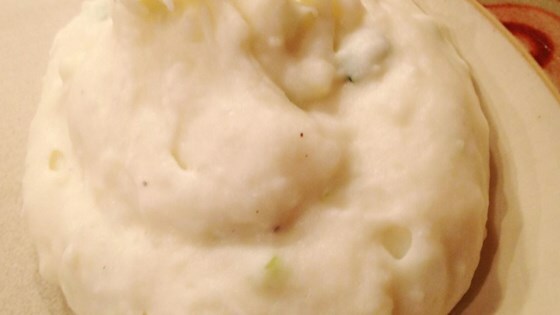 "A wonderful combination of potatoes, cream cheese, and sour cream that makes a delicious, tangy side dish to any meal." Preheat oven to 350 degrees F (175 degrees C). Grease a 1 1/2-quart baking dish. Mash potatoes in the pot with a potato masher or fork until smooth. Stir in cream cheese, sour cream, butter, green onions, salt, and pepper. Spoon into prepared baking dish. Bake in preheated oven until golden and bubbly, about 1 1/2 hours. These were amazing and everyone loved how creamy they were. I didn't add in the green onions or bake them. I also made them early and kept them hot in a crock pot for a couple of hours. Wonderful! I left out the onions but other than that, exactly as recipe called for and we ALL loved it even on day two! Delicious recipe that puts a new, tangy spin on an old favorite. The recipe worked perfectly for me as written.